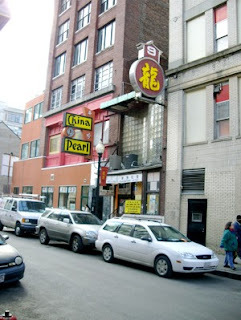 This is my favourite restaurant in Boston, China Pearl. It gives you the best dim sum experience in a true Chinese environment. The majority that come to have their dumplings and spring rolls here, are Chinese and you are forced to meet other people. Here you are seated around large tables, and you do not know who your neighbour will be. What is Dim Sum? Dim sum is a meal consisting of several small dishes, served steamed, or deep fried. As you are seated you order your Tsing Tao, or pour a small cup of tea, always available at the table. Then you start to order from different trolleys wheeled around. At China Pearl, I have serious trouble understanding what the Chinese trolley dollies say, so I always say "one" or "two", and you never know what you get. Usually you are not disappointed. You get the most delicious steamed dumplings with pork or seafood, or pork with black beans. However, you can get a surprise - fried chicken feet, being one of them.